During April, the average contiguous U.S. temperature was 48.9°F, 2.2°F below the 20th century average, making it the 13th coldest April on record and the coldest since 1997. Below-average temperatures were observed from the Rockies to the East Coast. Twenty-two states had an April temperature that ranked among the 10 coldest on record. Eight states had their second coldest April on record and two states—Iowa and Wisconsin—were record cold. 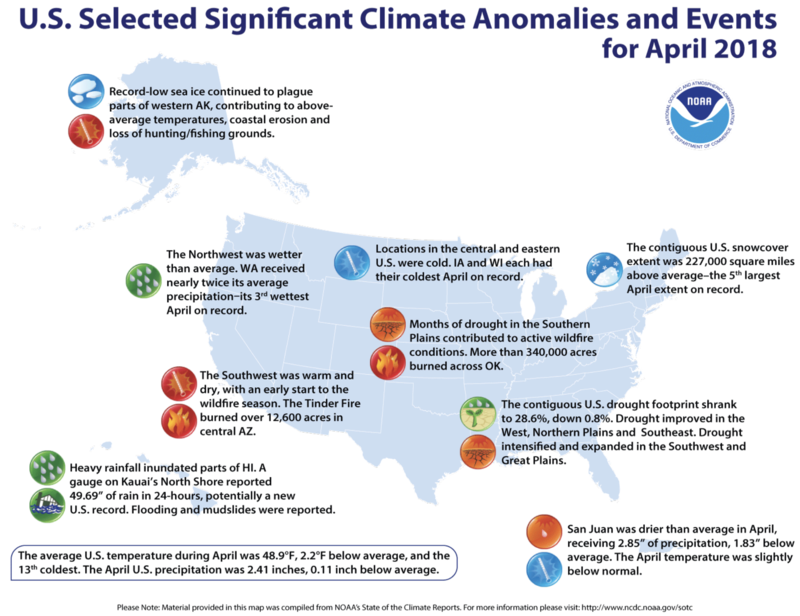 Above-average April temperatures were observed across much of the West, with record warm temperatures for parts of the Southwest. Arizona had its second warmest April on record with a statewide temperature 6.3°F above average. Above-average April temperatures were also observed in southern Florida. The contiguous U.S. average maximum (daytime) temperature during April was 61.7°F, 1.7°F below the 20th century average, marking the 21st coolest value on record and coolest since 1997. 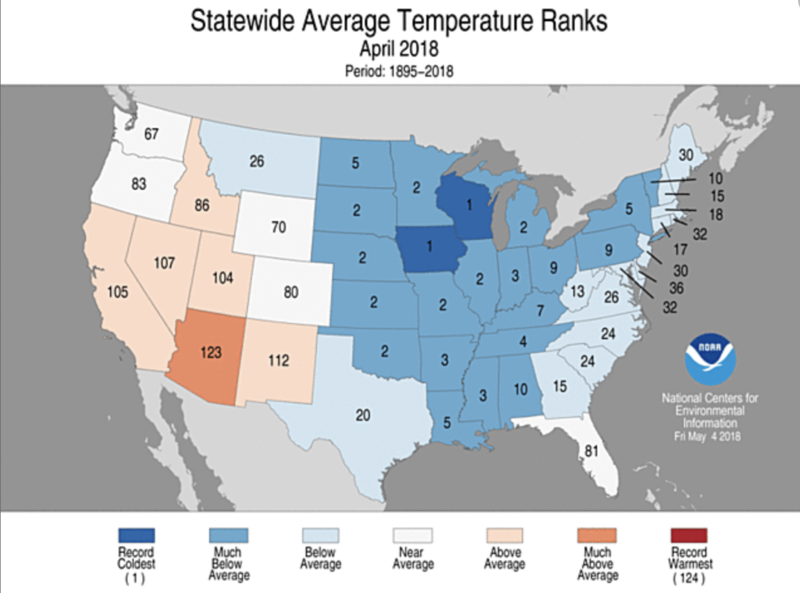 Below-average maximum temperatures were observed from the Rockies to East Coast, with 19 states having a top 10 cold April maximum temperature. Iowa had a record cold April maximum temperature. The location of record and near-record cold maximum temperature coincided with record-setting April snowfall. Above-average conditions were observed in the Southwest, where Arizona had its second warmest April maximum temperature on record. Nationally, the April minimum (nighttime) temperature was the seventh coldest on record at 36.1°F, 2.6°F below average. Below-average conditions were observed from the Rockies to the East Coast, where nine states had an average minimum temperature for the month that was record cold with fourteen additional states having much-below-average minimum temperatures. Above-average minimum temperatures were observed across the West. The Alaska average April temperature was 26.6°F, 3.3°F above the long-term mean. This ranked among the warmest third of the historical record. St. Paul and Cold Bay each had their fifth warmest April on record. Along the state’s west coast, sea ice continued to be much below average, contributing to the above-average temperatures. Some impacts of the low sea ice reported include coastal erosion and loss of hunting/fishing grounds. During April there were 7,068 record cold daily high (3,778) and low (3,290) temperature records, which was about 2.8 times the 2,563 record warm daily high (972) and low (1,591) temperature records. Based on NOAA’s Residential Energy Demand Temperature Index (REDTI), the contiguous U.S. temperature-related energy demand during April was 82 percent above average and was the fifth highest value in the 124-year period of record. The below-average temperatures in the Northeast and Midwest contributed to the above-average REDTI. The April precipitation total for the contiguous U.S. was 2.41 inches, 0.11 inch below average, and ranked near the median value in the 124-year period of record. During April, above-average precipitation was observed along the West Coast, Northern Rockies and much of the East. 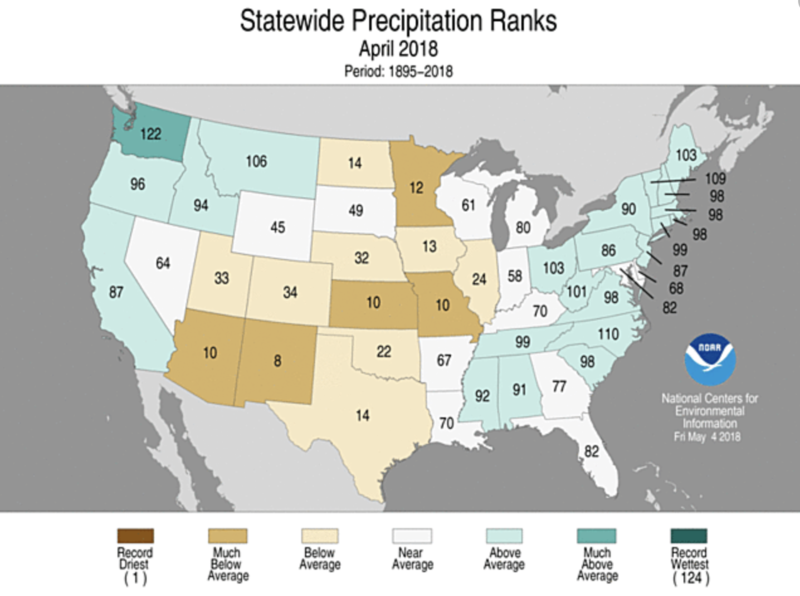 Record high precipitation was observed in parts of the Northwest, with Washington state having its third wettest April on record with 5.53 inches of precipitation, 2.70 inches above average. This was the wettest April for the state since 1996. Below-average precipitation stretched from the Southwest, through much of the Great Plains, where five states had a monthly precipitation total that was much below average. The dry conditions in the Southern Plains provided ideal wildfire conditions with numerous large wildfires burning during the month. Record-low precipitation was observed in parts of the Southwest and mid-Mississippi Valley. According to NOAA data, analyzed by the Rutgers Global Snow Lab, the contiguous U.S. snow cover extent during April was 508,000 square miles, 227,000 square miles above the 1981–2010 average. This was the fifth largest April snow cover extent on record for the Lower 48 since satellite records began 52 years ago, and the largest April snow cover extent since 1997. Above-average snow cover was observed for most northern locations in the nation, with below-average snow cover in the Southwest. Most locations on the Hawaiian Islands had above-average precipitation during April with Lihue having its sixth wettest April and Kula its third wettest. On April 14-15, heavy rain fell across Kauai causing major flooding and landslides. According to preliminary data, a rain gauge near Hanalei, on Kauai’s North Shore, reported 49.69 inches of rain in 24 hours, potentially a new national record. It is pending review by the National Climate Extremes Committee. According to the May 1 U.S. Drought Monitor report, 28.6 percent of the contiguous U.S. was in drought, down from 29.4 percent at the beginning of April. Drought conditions improved in California, the Northern Plains and the Southeast. Drought also improved in parts of the Alaskan panhandle. Drought conditions expanded and intensified in the Southwest and Central to Southern Plains. The percent area of the contiguous U.S. experiencing D4 – Exceptional Drought, the worst category, expanded to 2.2 percent, the highest since November 2016. D4 drought conditions stretched from the Southwest to Southern Plains.